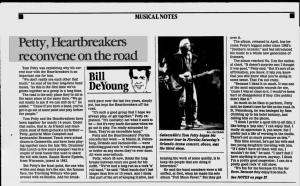 Tom Petty was explaining why his current tour with the Heartbreakers is an important one for him. "We don't see each other that much," he said of his four long-time band mates, "so this is the first time we've gotten together as a group in a long time." The road is the only place they're all in the same place at the same time. "We go out mostly to see if we can still do it," he added. "'Cause if you have a band, you've got to go out at some point and play before the people." Tom Petty and the Heartbreakers have been together for nearly 14 years. Under that name, that is. As friends and musicians, most of them go back a lot farther -- Petty, guitarist Mike Campbell, and keyboardist Benmont Tench were school chums in Gainesville, and have been playing together since the late '60s. Drummer Stan Lynch (a few years younger) was in a couple of local bands that used to share the bill with them. Bassist Howie Epstein, from Wisconsin, joined in 1982. But Petty's the vocal point, the one who writes and sings; he's the star, the famous face, the Traveling Wilbury who pals around with ex-Beatles. And his breakneck pace over the last two years, simply put, has kept the Heartbreakers off the road. "It's such a good group that I hope we always play, or get together," Petty explained. "It's (socially) not what it used to be -- but it's very much the same when we go out to play. I'm really astounded by them. They're an incredible band." Petty and the Heartbreakers' Florida concerts last week -- in Miami, St. Petersburg, Orlando and Jacksonville -- were rollicking good rock 'n' roll revues, as good or better as any shows they've ever done. All were near-sellouts. Petty, who's 35 now, thinks the long breaks between tours are good for his outfit. "We've had a long run as a rock 'n' roll band," he said. "Most bands don't last longer than five or 10 years. And I think that part of the art of keeping it alive, and keeping the work of some quality, is to keep the people that are doing it interested." He said the band members were a bit miffed, at first, when he made his solo album "Full Moon Fever.' But they got over it. The album, released in April, has become Petty's biggest seller since 1985's "Southern Accents," and has introduced his music to a whole new generation of listeners. The album reached No. 3 on the national chart. "It doesn't surprise me; I thought it was good," Petty said. "But it's sort of an affirmation, you know, it lets you know that you still know what you're doing in some sense. That I'm not crazy. "Because I liked it so much. It was one of the most enjoyable records for me, 'cause I was so close to it. I would've been hurt or disappointed if they (the public) didn't like it." As much as he likes to perform, Petty said, he doesn't care for life on the road. In St. Petersburg he was besieged by fans climbing up to his hotel balcony, and calling him on the phone. "I think I prefer a quiet life to all this. I like being a 'pop star,' I can enjoy that. I really do appreciate it, you know, but I prefer just a life of working in the studio. There's not as much pressure as this." This time around, he's got his wife and two young daughters traveling with him. "If I didn't have all them with me, I wouldn't do this," he said. "I don't feel I have anything to prove, anyway. I think I'm a pretty good songwriter. I can do a pretty good rock 'n' roll show. "It's fun for me because it's fun for them. Because they enjoy it so much. To me, I think it would get routine, and with the family along with me, it's a lot nicer because we all enjoy it and it's exciting." Petty insisted that he never thinks about "the career." "Honestly, all I want to do is enjoy myself. I don't give a sh-- about anything else. I like to go to the studio, and write songs, and make records that I'd like; that I'd take home and play, and get some kick out of. "That's easy to say and hard to do. But the main discovery I've had i the last few years is: I've gotten a lot of joy out of making music. "I do like to get up and sing all the songs for them" -- he gestures to his two daughters -- "sometimes; it's a lot of fun. But I don't see myself living this lifestyle for the rest of my life." He added that he had no immediate plans for the future. He likes it that way. "I'm so happy and grateful to everybody," he said. "It's hard to believe when you reflect on it. "The scary thing is reflecting on it too much. You get to the point where you're no use to anybody. "I mean, we're real sick of Tom Petty, in some ways. We see more of him than anybody. We have to see him all the time." 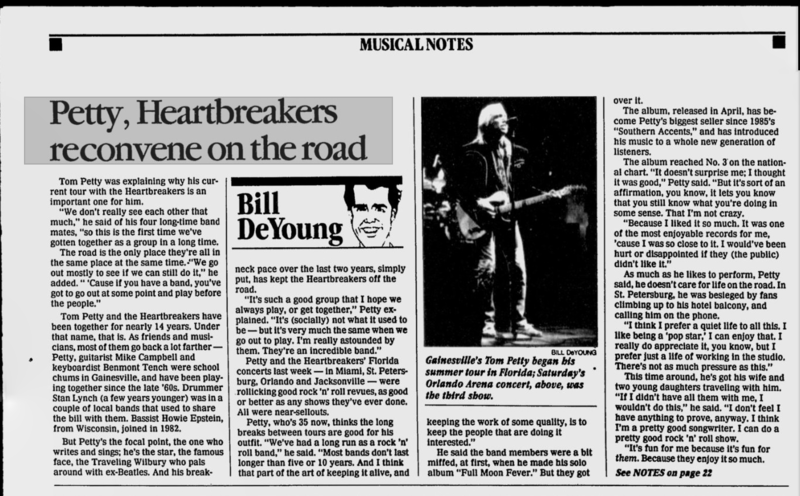 In Orlando, Petty and the Heartbreakers did their 1981 "Something Big," the very first time it had ever been performed live. It was an inspired rendition, and all five of them grinned, swayed and rocked happy through it. 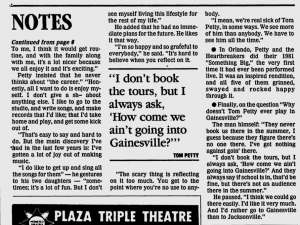 Finally, on the question "Why doesn't Tom Petty ever play in Gainesville?" The man himself: "They never book us there in the summer, I guess because they figure there's no one there. I've got nothing against goin' there. 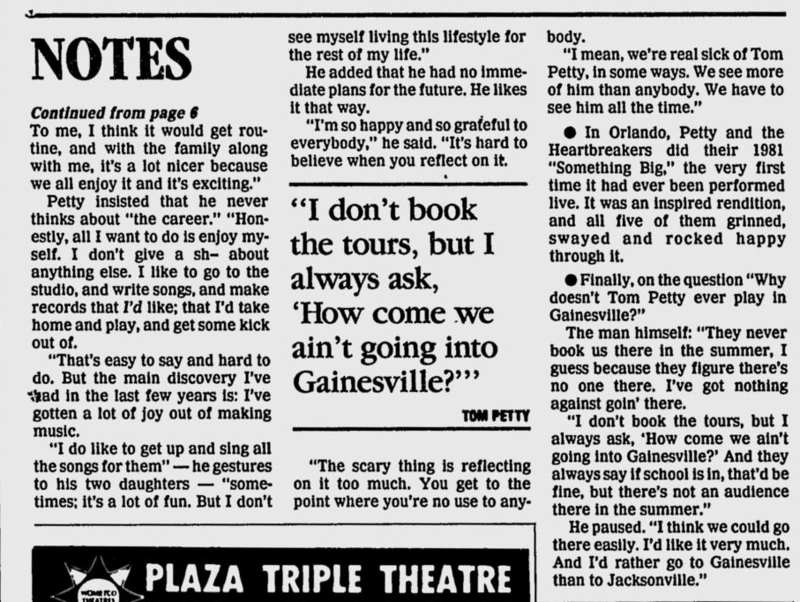 "I don't book the tours, but I always ask, 'How come we ain't going into Gainesville?' And they always say if school is in, that'd be fine, but there's not an audience there in summer." He paused. "I think we could go there easily. I'd like it very much. And I'd rather go to Gainesville than to Jacksonville."